" If there is anyone here who feels called to the priesthood please come forward." Here I am , I am ready, Send me." This is what I was saying to myself as I went forward. I went to the altar and stood with a wonderful bishop...a-a-a-a-a woman. She told me to stand beside her and to serve communion with her. She said, " I do not like to be alone on the altar. "I felt it a privilege to stand with her and see the faces of hopeful people. I said, "Niether do I." This has remained true to this very day. Elsie McGrath and I met each other in a sidestreet old home that had become a meeting house for people who called themselves, The Catholic Action Network. It was in the heart of St. Louis, Missouri. We have now known each other for two years, and yet we have shared a lifetime in those two years. We did our first liturgy together after ordination, and with few exceptions, have stood on the altar of Godde together and proclaimed Godde's word and broke bread with all people who have been at our liturgies. "Your courage gives me hope." "The Force is with you." See Ya soon Archbishop Burke, and you too Pope Benedict. Our first Women's Ordination Worldwide (WOW) Conference was held in Dublin, Ireland in July of 2001. It was sponsored by Brothers and Sisters in Christ (BASIC), the Irish women's ordination group. During the gathering, Soline Vatinel Humbert, one of BASIC's founding members, told me about about the Synod of Bishops that was to be held in Rome during October, 2001. That got my mind swirling into the "Ordain Women" billboard mode. Seven Chicago Women's Ordination Conference (WOC) women originated the billboard idea in the spring of 2000 when they put up their billboard: "You're waiting for a sign from God? This is it: "Ordain Women" in response to the Archdiocese of Chicago's million dollar campaign for male priests. A couple of us then brought the "Ordain Women" billboard to Milwaukee (my hometown) for the November, 2000 CTA Conference. Then we moved it to Lexington from December through early February, 2001, where it was featured in the Lexington Herald-Leader newspaper three times. Then the Southeastern Pennsylvnia WOC women took it to Philadelphia. Other billboards appeared in LaCrosse, WI, and Detroit, MI as well as in Minnesota and Iowa. For the WOW Conference, BASIC put up six billboards across Ireland of their commissoned New Last Supper painting, showing Jesus sharing at a Jewish Passover meal with women, men, and children. The billboard was a useful method of promoting women's ordination to the public. When Soline told me about the upcoming Synod of Bishops in Rome, a seed was planted. I returned home to Lexington and within two weeks I was flying back to Europe -- but this time to Rome -- intent on placing a billboard as close as I could to the Pope's window. I moved strictly on faith. After 10 days of knocking on doors, and with the grace of God, the groundwork was laid for a banner. What an adventure! Back in Lexington, a former Italian priest friend and his wife communicated with the banner-maker. A CD was sent from Chicago WOC to WOC headquarters to Rome with the image of the woman priest from WOC's "Ordain Women" poster. Funds were being raised. With the help of people in the U.S. and abroad, the banner went forward. Meanwhile, I heard that the European We Are Church group was organizing a "Shadow Synod." My friend Judy McLaughlin and I flew from Lexington to Rome. I brought along three Kentucky Derby pies and three fifths of Kentucky Maker's Mark Bourbon as gifts for the three Italian men in Rome who helped get the banner displayed. After I dropped them off, Judy, and I took a walk on the edge of Rome near the Sistine Chapel. There on the eve of the feast day of St. Francis of Assisi, the banner was up. We cheered! 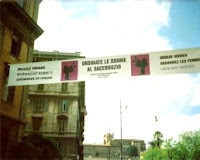 The banner hung during the Synod of Bishops in October, 2001 on the edge of Rome and the Vatican. It called for the ordination of women in seven languages: Italian, English, Polish, German, Spanish, French and Latin. Over one hundred members of Catholic reform groups from all over the world gathered nearby --at the Waldesian Theological Seminary (a Protestant seminary) -- to discuss reform measures for our Church as the bishops were meeting. This week-long gathering of worldwide Catholic reformers was sponsored by the Europeans' We Are Church. The outcome of the action? We celebrated a liturgy to "bless the banner". Lots of people from all over the world saw it...and indeed it was a first. The Rome police came out while we were celebrating our liturgy and asked for the papers that gave permission for the banner. I had left the documents at the Salvation Army Guesthouse where we were staying, but called the banner-maker who came with the papers for the police. They were astounded that we had such a banner so close to the Vatican!